Interested in understanding and optimizing the new Google+ business pages? How about a recap of Google’s big-news algorithm changes of 2011 and how to tackle them? Or what about a tutorial on writing calls to action, or best practices for mobile website design? All this and more is in this month’s SEO Newsletter, published today. This post dives into the highlights of December’s issue. Google admittedly has hundreds of algorithm updates per year, and 2011 saw some dramatic impacts as a result of some of the more notable algorithm changes, including the Panda Update and the new Freshness Update, announced just last month. In this piece by Virginia Nussey, she explains key algorithm changes for 2011 and possible tactics on how to respond to them. Becoming an online resource centered on education and research. Adhering to Google’s quality standards. Using linking and site architecture to theme content. Topics that require frequently updated information. For more on strategies that can apply to the Freshness Update, check out Virginia’s tips in December’s feature article. Defining a call to action and how it relates to the discipline of conversion optimization. How to identify and understand your audience with the tools available to marketers. How to write calls to action that speak to a clearly defined audience. Check out the article for more in-depth information on how to write a good call to action. Google+ business pages were unveiled in November, and many were excited to see this logincal next-step development to the search engine’s social community. Sara Borghi of Bruce Clay Australia delves into what you need to know about this topic, and how to create and optimize Google+ business pages. Taglines: What words best describe your page? Promoting profile on your website. Monitoring analytics once Google+ is integrated. Mention users of Google+ in posts. Follow the right people and pages. Link the page with AdWords account. Sara also delves into Google+ versus Facebook versus Twitter, in addition to the business pages’ potential impact on SEO. Check out all these great tips and more in a very thorough analysis of the Google+ business page. In this article, Siddharth Lal of Bruce Clay India delves into growing need for websites to be mobile friendly – especially since Google recently announced mobile-optimized pages will perform better in AdWords, driving more mobile traffic at a lower cost. Mobile application versus dedicated mobile site. In the article, each of the bullet points above have further information for tackling a mobile-ready site, and he also offers several resources that can help you on your way. A very informative piece overall on getting your feet wet with mobile-friendly websites. Packed with up-to-date paid search and SEO methodologies and tactics, the book is currently in Italian but may soon be available in other European languages. Readers can expect to learn how to increase visibility in the search results and generate more qualified traffic to a site, in addition to turning Web marketing into a powerful advertising and marketing strategy, and much more. Check out all the news for the month plus our hot topic on Google’s new menu bar redesign and the implications that, in December’s SEO Newsletter, Volume 97. 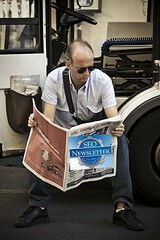 Our SEO Newsletter resumes in January 2012 – if you’re not already on our mailing list, sign up now! The last Google algorithms update decreased my search engine traffic almost four times. I’m hard working to put it back at least and more, but I don’t understand all the hacks yet. Highly appreciate your site and articles.